Changing or replacing your car speakers is the most cost-effective upgrade you could do for your automobiles. The factory-installed OEM speakers could be frustrating at times and for audiophiles, replacing these with the best car speakers is the only way forward. While you can choose to go for full range speakers, you can rather take it a step further by choosing from some of the best component speakers for car. We’ll go ahead to review some of the best 6.5 component speakers but first of all, why would you need the best component speakers for your car? You may have known that you could easily choose from either of full range or component speakers. Both of these come with their benefits and drawbacks. Full range speakers are easy to install and just like the name suggests, they have been fully combined to offer all the different range of sound production from the same source. The component speakers, on the other hand, are specially engineered for better sound delivery. Though they may generally cost more, they offer unparalleled sound quality. This is because the speaker system is composed in most cases of a pair of tweeters, as well as mid-bass drivers matched with a crossover to limit the range of frequency that each separate component delivers. For these reasons, the best component speakers for bass and sound quality are so excellent that the sound comes alive, undistorted and are delivered with great depth. Although they cost more than full-range speakers, our review of the best component car speakers still contains some of the best budget component speakers that will deliver better high-fidelity output while still being affordable. You should check out the build quality because this will majorly affect the performance. The woofer component should be constructed from lightweight but stiff materials such as polypropylene. This may also be mixed with other materials like mica so as to get a stiffer woofer that will yield a more precise bass response. Woven fabrics and or metal-coated synthetic are also good as they are able to withstand extreme heat, moisture, and cold. The tweeter material will normally have a profound effect on the type of sound a speaker produces. You can choose tweeter materials made from soft materials like poly, silk and textile as these speakers sound more refined and kind of mellow. You may also go for speakers with harder tweeter materials like ceramic, graphite or metals if you like the highs to come off as bright and snappy. The surround materials affect the bass response of speakers. These surrounds determine how freely the woofer can move and how bold the bass is emitted. Although foam and rubber surround cost less and is still acceptable, the rubber surround materials offer the best overall performance and durability. The surround must be durable as they’ll have to stand up to weather and environmental extremes like temperature and humidity. Other features such as crossovers, passive in most cases should also be checked out. The crossovers are used to separate frequencies sent to the woofer and tweeters to ensure a clean and vibrant output while maintaining efficient energy use. Other specifications such as sensitivity power output and more should also be checked to see if they match one’s requirement before purchase. We reviewed several of the most popular component speakers in the market and have brought to you the best picks among the lot. Whether you’re looking for the best component speakers for bass or simply the best budget components speakers, these speakers are the best component speakers that will easily turn around your on-the-road entertainment. The Hertz HSK 165 XL comes in as number one on our list of the best component speakers for cars. This is down to its design that has made it one of the highest performing speakers we’ve reviewed. It has similar designs and performance with the popular but pricier MLK 165. The 2-Way speaker system features professional-grade materials for its various components. Its balanced sound output, as well as a vibrant and clear reproduction, has made it the audiophiles’ top choice for component car speakers. This high powered component speaker from the reputable Polk Audio stables does not only have the good looks but also boasts excellent performance to match such aesthetic look and design. When you need the best component speakers that will provide dynamic balance while being able to withstand weather extremes, then the Polk DB6501 may be what you need. The rubber surround, the silk dome tweeter, the woofer and other components are made from high-grade materials to offer a great performance and durability. Premium component speakers such as the Rockford Fosgate P165-S cannot be overlooked when shopping for the best component speakers for cars. They promise so much and deliver excellent performance for a fair amount. The features and technologies in use in these speakers have made them a favorite of many car audio enthusiasts. The lightweight polypropylene cone and the butyl rubber surround ensure great bass response without compromise on quality. The crossover comes fitted with the speaker to reduce the hassles of installation. Although it seems a little more expensive than the other models and brands on our list of the best 6.5 component speakers, it has the features and performance of the best 6.5 component speakers under $200 and for that, you are getting the full value for the amount this set costs. It has this design which along with the black color would immediately enhance the aesthetic appeal of any car interior. When you want the best of both worlds, you can get the best design and performance out of this beast in a beautiful body. The Infinity Reference 6030cs are a great pair of component speakers and if you seem to be worried about the cost of component speakers over full range speakers, then, you may as well find the 6030cs a great pick as it offers great sound at an incredible price. It’s probably the best 6.5 component speakers under 100 and hardly will you find a better sounding speaker within that price range. 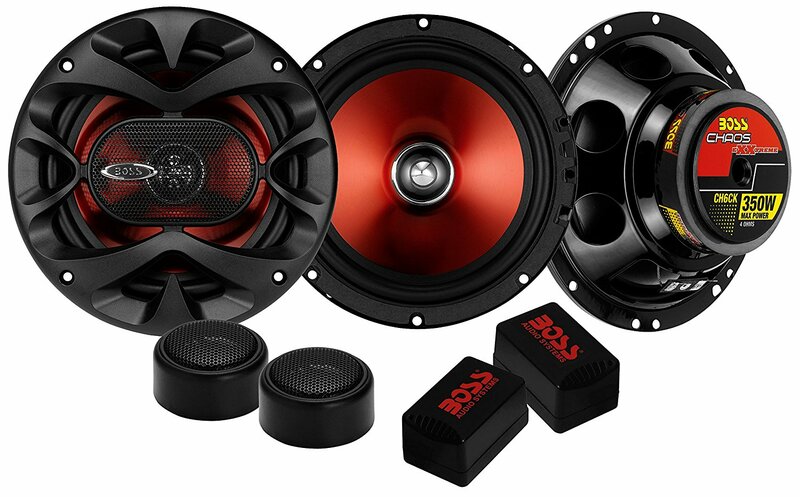 BOSS Audio CH6CK is our top pick among the best component speakers for cars while the Hertz HSK 165 XL, Infinity Reference 6030cs is our pick among the best 6.5 component speakers for the money. The 5 speakers reviewed above are great if you’d like to turn around what your car audio entertainment can deliver. You will be doing yourself great good as far as sound quality and the best component speakers for cars are concerned. Choose your pick from these and begin to enjoy high-fidelity entertainment in your cars. You can always thank us later!